So its Tuesday afternoon prime time on Planet GNOME, here’s an inside look on whats been going on this week for Glade. Last week we got the GtkToolPalette integrated into Glade and got Glade vertical again, this week I went on a rampage of hunting down startup warnings, warnings caused by loading Glade files and generally any warnings/assertions that can be fired while manipulating projects in Glade. A nasty data corruption bug occurring when loading liststore data that contains gaps (missing unserializable columns) was also fixed. Once these items were fixed I was pretty much left on my own to fix some issues of my choosing and improve some things in Glade – awesome – so I decided to prioritize on issues that did not need backing support in GTK+, as there has been lots of development there that we haven’t been able to keep up with. Ok so the editor looks alright at first sight but there are some confusing aspects, for instance the “user data” in the signal can only ever refer to an object in the Glade file – no mention of that is made. Furthermore when one goes through the whole google research to find that the user data is supposed to be an object, they immediately get stumped by GTK+ swapping the object at connection time for seemingly no desired reason – very, very confusing. Something to keep in mind as well is that signal definitions in Glade have generally been unused. Mostly because of an inability to pass data external to the Glade file as user data to callbacks. 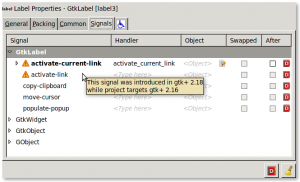 Generally people use a parent or controller object as a module pointer to be passed to all callbacks; this technical problem with signals has really been a non-issue ever since the introduction of the gtk_builder_connect_signals() api which takes a default pointer argument to pass to signals for just this purpose. Now the signal editor lets you view the documentation for a signal at the click of an icon (Thank you Frédéric Péters for getting DevHelp page contextual searches working again ! sorry for waiting 6 months+ to notice !). Now versioning support icons/tooltips show up for signals that are introduced in the future of your project’s target version. Signal, Handler and Object fields in the editor are user resizable but allocate a reasonable size. So, with a rocking new signal editor in master I still had some hours to kill, I went on to tackle the relationships of GtkActionGroup <–> GtkAction in Glade – I wasn’t able to pull out a customized editor for this yet, but I imagine it will look like the menu or toolbar editor and allow hierarchical configuration of the project’s action groups/actions (currently Glade will only let you add an action to a group via the Inspector widget: Right click -> Add widget here / Paste commands will do the trick). 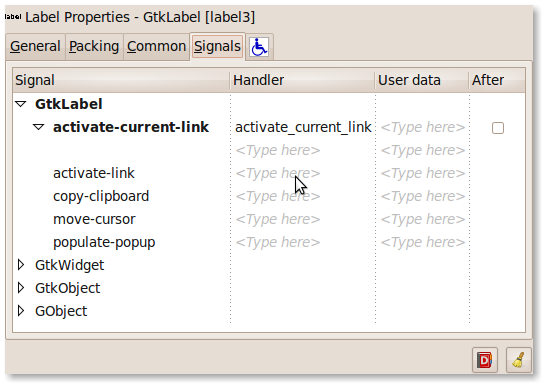 Glade now also lets you set an accelerator key for a GtkAction, the property only applies to actions which are placed into a group, ideally this will be the ultimate place to define accelerator keys using Glade so that they integrate well with menus and toolbars. A big thankyou to Openismus GmbH who sponsored the project and made all of these unlikely advancements in Glade actually happen. I’ll be turning my attention away from Glade this week to look at some other serious GNOME issues, keep up with my blog for regular updates on this Openismus sponsored effort. Why improving Glade if it’s being deprecated? libglade is being deprecated in favor of GtkBuilder. please check out our website for more information about Glade. antimonio, libglade is deprecated. Glade is not at all deprecated. Glade can use either the old libglade or new GtkBuilder file format. Sure I have no objection that you cite my blog and link back to it.